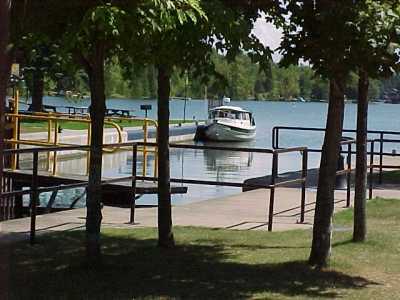 Launch: Birch Point Marina, Bobcaygeon, Ontario. Ramp is small and looks iffy, but it functions just fine. Good place to leave tow vehicle and trailer. Nice folks at the marina - both those who run it and those who keep their boats in the covered slips. (They have parties on Friday nights). Nearby campsites:Emily Provincial Park, at the bottom end of Pigeon Lake is nearby and very pretty, with good walking trails. 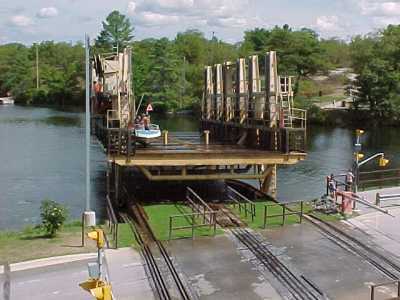 Comments: This put-in is about mid-way on the Trent-Severn Waterway. The route is beautiful either direction. 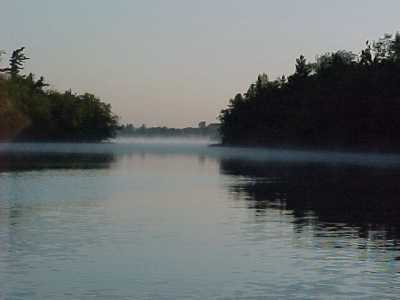 -----This scenic small-boat waterway connects Lake Ontario directly to Lake Huron, bypassing most of the open, shallow waters of both Lakes Ontario and Erie. The canal wanders two hundred crooked miles connecting lakes and rivers. Some, like Lake Simco, are large and require caution on windy days. 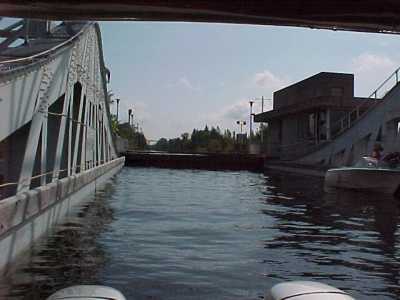 There are forty-four locks, some still hand-cranked. It transects the southern Canadian Shield, that ancient terrane of the earliest Earth crust. The rocks are elegant - granite mounds, metamorphic gneisses sparkling with mica, and somber, contorted schist. 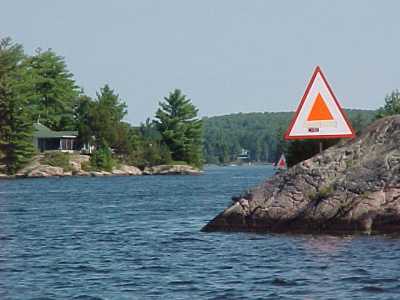 Of course, to a boater, those solid rocks are hazard, and careful attention must be paid to the navigation buoys. -----After completing the Rideau Canal, we put Halcyon on her trailer. We went out for a marvelous dinner to celebrate, and filled her tanks as well. 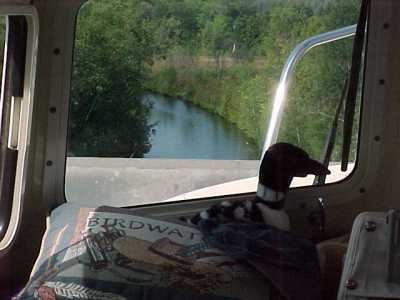 Then, we trundled off across the wooded farmland of Southern Ontario bound for the Trent/Severn. Now, the usual dilemma, where to put in. Once again, the C-Dory website solved the problem. Just in time, we heard from Duane who had cruised the canal the year before. He kindly offered his charts and suggested launching at Birch Point Marina in Bobcaygeon. We checked it out, but not before first having a great pickerel dinner in town. The ramp, like Duane said, was iffy but he used it and it was fine. -----Ever have a Bobawaba Day? We first heard that term in a town called Alice, in the Australian Outback. Well, of course, we all have Bobawaba Days. But we had to go and make one! Everything was going great - tummies full, boat at a nice-looking marina - we should have trusted Duane and launcched and had a great day. No, because of residual doubts about the ramp (you know who the conservative one was, who had the doubts), we made a Bobawaba. We left Halcyon at Birch Point to check out the surrounding territory for a "better ramp" (Bill's words; El thought it looked great). We found a great-looking ramp, all smooth, wide, and easy - adjacent to a kid hangout, and I could see them checking out our truck for a joy ride (or spare parts). Another ramp was at a first-class marina whose owner had a personality more suited for the Third Reich than working with the public - and he wanted to charge $seven/day just to park the truck! No wonder the place looked so shiny. Another, at a private camp, had delightful folks (with great fruit pie), but ended in an escarpment somewhat resembling the south rim of the Grand Canyon. The lady owner said, with a frown, "Shouldn't be any trouble getting her in but you might not get her, or your trailer, back out." Great! So, after wasting a perfectly good afternoon, it was back to Birch Point and Duane's iffy ramp. -----It was now after five, and we thought the marina would be abandoned for the night. Dark moisture-laden storm clouds were forming overhead. There was a distant rumble of thunder. Just as we had Halcyon hooked up heading for the ramp, a chap named Dave, with a Birch Point sweatshirt, came running over to help us make the U-turn and guide us down the ramp. He was a happy, smiling chap we assumed worked for the marina. No, we found out later. He keeps his boat there and is a prosecutor from Toronto. His boat, by the way, is named, Before the Bar. After we glided effortlessly down the ramp, he suggested we use a vacant slip adjacent to his and join the Friday night party. -----Turns out the slip was under a high roof, and we tied off just as the storm broke - what a delight to be aboard, thunder and lightning and driving rain, and have all the windows and hatch open! So, the Bobawaba Day ended with sundowners at the boat-owners traditional summer Friday night party. -----The next morning, we slithered out of harbor (El's New England expression), and faced the usual cruisers dilemma - port or starboard. 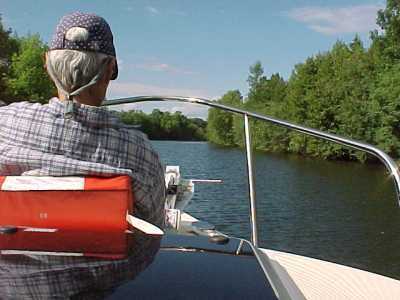 -----"To the starboard is Lake Katchewanooga and port is Lake Couchiching," El said squinting at the charts. "Doesn't seem to make any difference, does it?" -----"Nope, guess not," I said, turning hard a'starboard. A police officer friend once told me, "Right-handers turn right, lefties go left. Good to know if you're chasing a suspect." I didn't think to ask him how he might know the handed-ness of his suspect, but it does seem he was correct. So, now you know I'm a righty. 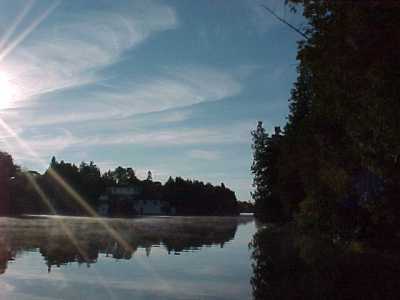 -----We have a few recommendations: The Old Mill Restaurant below the Young's Point Lock, Electric Clove in Peterborough, Water's Edge in Bobcaygeon, Webers in Orillia (and Gramma's for thick cinnamon toast at breakfast), and ice cream at The Trading Company. All are short strolls from a dock. Oh, yes - if you have the courage to order in his funky-looking place, there is a restaurant just above the Couchiching lock. An Englishman runs it. We had a slice of his homemade pie a la mode and coffee. Outstanding! It's enjoyable talking with him. He began life in Canada as a cook for missions in the north. He's had his restaurant for over 35 years, and it looks like he has never thrown out a thing he's owned. 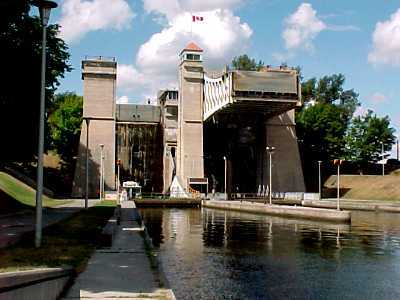 -----The Trent/Severn is a most beautiful waterway and a delight to travel. The ancient rocks are covered with evergreens, the water is clear, and there's the occasional cottage perched on the rocky islet - great cruising. It is a civilized route, with nice anchorages, easy tie-ups at locks, charming small towns, friendly folks, history, good locks, and well-maintained marks. It is popular with Canadians and busy in the summer, but most boaters are courteous and respectful of wakes and anchoring. 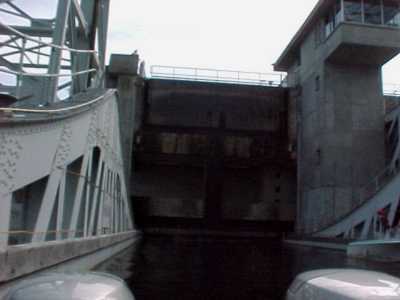 -----There are several unique features to the Trent/Severn. First, the lift locks! Well, we all know that locks are just a chamber built in the canal, with huge doors, and water either floods in to lift you, or out to drop you. 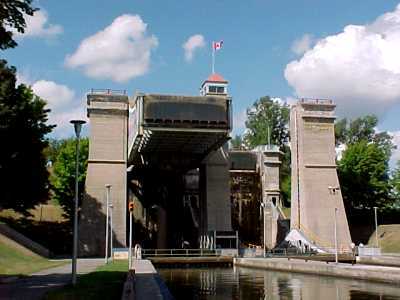 Not the two lift locks on the Trent/Severn. You cruise through the open door, which promptly closes behind. All's normal - but the water level doesn't change. The whole chamber starts to lift into the air! You peer over the side, or even worse ahead over the low door, and the land drops away below you. 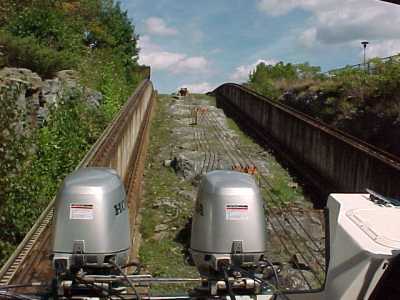 When you reach the top, the front door opens and you glide out into the canal. Hydraulic! The whole kit and caboodle goes up or down - like an elevator - exactly balanced by the matching chamber beside you. Amazing and a little scary. 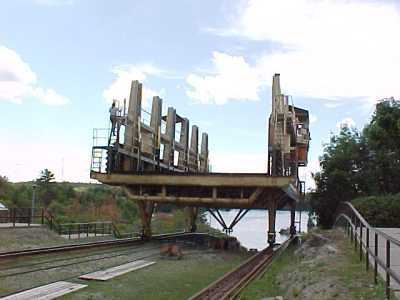 -----The other distinctive feature of the Trent/Severn is the marine railway. Sure, we're all familiar with them. They lift big boats out of the water at marinas. Well, this one, lifts all cruising boats up and over a big hunk of granite and deposits them on the other side! It is part of the route and it is amazing to watch. The View From Aboard - Yikes!